In 1853, with money in his pocket and elegant clothes in his saddlebags, a twenty-four-year-old New Englander of aristocratic Yankee stock toured the territories of California, Oregon, Washington, and British Columbia. 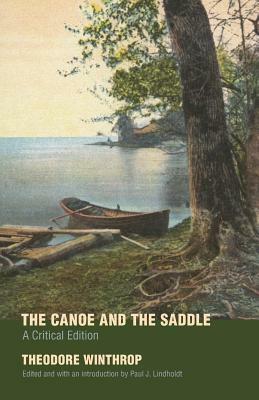 The Canoe and the Saddle recounts Theodore Winthrop’s Northwest tour. A novelized memoir of his travels, it became a bestseller when it was published shortly after the author’s untimely death in the Civil War. This critical edition of Winthrop’s work, the first in over half a century, offers readers the original text with a narrative overview of the nature and culture of the Pacific Northwest and reflections on the ecological and racial turmoil that gripped the region at the time. It also provides a fresh perspective on the aesthetic, historical, cultural, anthropological, social, and environmental contexts in which Winthrop wrote his sometimes disturbing, sometimes enlightening, and always riveting account. Whether offering portraits of Native American culture—in particular, commenting on the Chinook Jargon—making keen and often prescient observations on nature, or deploying transcendental, animist, or Hudson River School aesthetics (likely learned from his friend Frederick Church), Winthrop develops a clear and compelling picture of a time and place still resonant and relevant today. Paul J. Lindholdt is an associate professor of English at Eastern Washington University. He is the coeditor of Holding Common Ground: The Individual and Public Lands in the American West and Cascadia Wild: Protecting an International Ecosystem.